I love black and white photography. It can simplify a scene by removing the distraction of color. It’s an excellent option if you want to shoot in harsh midday light. And you can create incredible drama. If you do a lot of black and white photography, you probably already know that dodging and burning is critical to making stunning images. But did you know that one of the best ways to make a great black and white image is by using color? That sounds strange, but there are at least a couple of great reasons to use color in a monochrome image. First, the original color in the image is excellent for making masks that target specific subjects in the image by color. And second, finishing the image with a slight tinge of color (such as blue or sepia) can greatly enhance the mood vs a pure black and white result. We’ll cover all three of these techniques in this tutorial on how to create black and white photos with luminosity masks. When different subjects have similar tonal values, color can be a great way to help discriminate when creating luminosity selections. In the video tutorial above, the rocks are yellow and the sky is blue. That makes it very easy to select one or the other, even though they have somewhat similar luminosity values. In this particular demo, I probably could have used the Quick Select tool successfully, but I would have to work to avoid edge artifacts. And the Quick Select isn’t always an option. So adding color to your selecting and masking workflow is incredibly helpful. You’ll need to have access your original color to be able to create these color-based selections. My favorite way to do that is to simply add a Black and White (B&W) adjustment layer above the original color image. This lets you view your work in black and white, but access the color at any time simply by making that B&W adjustment layer invisible temporarily. However, if you prefer a different method for converting to black and white, that’s fine too. You can either keep a duplicate layer in color, or just load the color image as needed from your RAW file. If you use this method, it’s important that the duplicate version only differs in color. Any distortion correction, cropping, cloning, etc should be done first or last because any misalignment of the pixels will make the color copy a poor option for creating masks. Lumenzia offers several color-based selection methods, including adjustment of the B&W layer at the bottom of the orange layer stack created while previewing masks, color masks, and the “Color” group. If you are using my free luminosity masking panel, I recommend getting familiar with the Color Range tool found under the Select menu in Photoshop, and using this to create group masks based on color. You can also try to use channels, but most colors include some of each RGB channel, so I prefer the other options. The key to any great black and white image is control of the tones, and that is done with dodging and burning (lightening and darkening). This helps control attention in the image and enhances the feeling of depth. Use the “Dodge” button in Lumenzia to get started. Or create a blank layer set to “soft light” or “overlay” blend mode, and paint white and black to dodge and burn. Any area painted white will become lighter, and any area painted black will become darker. Use luminosity or color based selections to target your painting. This will help you create better results faster and with higher quality. For example, in the tutorial above, I use luminosity selections to avoid dodging (lightening) the shadows in the cracks of the rocks. If I painted without a selection, the rocks would lose contrast and feel a bit washed out. A slight bit of color toning can dramatically improve black and white images. 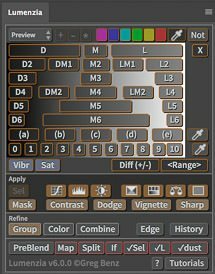 Sepia-toning is the most familiar way of doing this, but you can use any color in any amount. I like to use minimal amounts of blue or yellow to tone the image. This let’s me use Blue to add a cold and imposing mood to a barren landscape, or yellow to add warmth to a portrait of a smiling person. It’s a subtle psychological cue that helps reinforce the artistic intent of the image. There are several ways you can finish the image by adding a subtle color tone. A Color Balance adjustment layer is a great way to mix your favorite color tones. You could alternatively use a Solid Color layer set to blend mode to pick a specific color instead of mixing CMY. However, I find the tones shadows heavy with Solid Color, so consider adding a lights BlendIf to balance the color more evenly across all tones (this will prevent excess color in the shadows). Or another option is to use a Color Lookup layer, especially the blue and sepia options (under the Abstract dropdown) or Smokey (under Device Link). With all of these, try turning the effect on and off to compare and review the color and opacity. Your eyes will otherwise quickly adjust to the effect and make it harder to evaluate. If you enjoyed this tutorial, be sure to also check out my newer tutorial on how to create beautiful B&W flowers with luminosity masks.